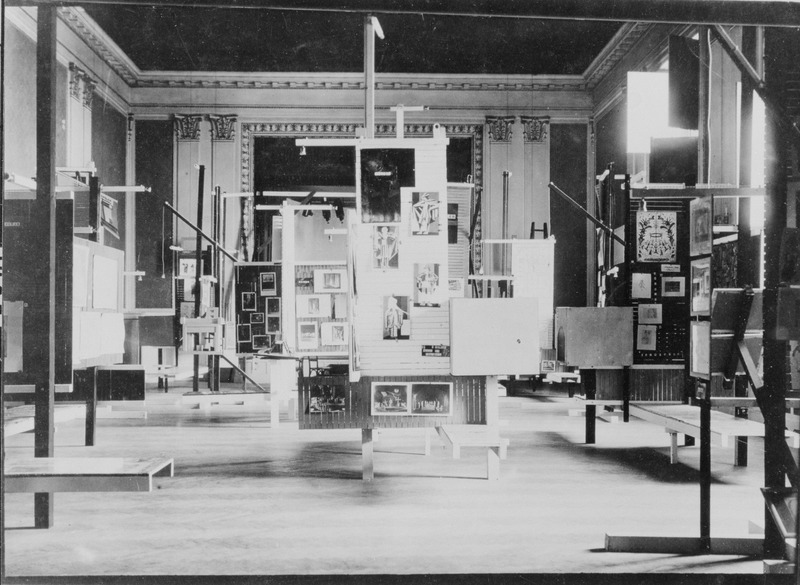 Vienna 1924: The artist-architect Frederick Kiesler (1890-1965) curated, organised and designed the Internationale Ausstellung neuer Theatertechnik (International Exhibition of New Theatre Techniques) at the Konzerthaus. As a driven networker he invited the who’s who of the European avant-garde and exhibited the most radical contributions to the renewal of theatre - the Russian Constructivists and Italian Futurists as well as representatives of the Bauhaus in Weimar. Expanding the boundaries of the stage, he included cutting edge experiments in film and gave the world premiere of Ballet Mécanique by Fernand Léger and Dudley Murphy. Adapting the idea of the Viennese Gesamtkunstwerk (total work of art), Kiesler developed a holistic concept of design by using a unified geometrical formal language with the Constructivist colours red, black and white – from admission tickets, posters and catalogue to the groundbreaking exhibition architecture, the Leger- and Trägersystem (L+T System), overcoming what he called the “romantic museum’s surrogate” and “decorative bluff” of traditional exhibitions. The centerpiece of the exhibition was Kiesler’s Raumbühne (Space Stage), his temporary vision of a stage of the future. On a scale of 1:1, this free standing, spiral shaped construction for a theater-in-the-round occupied the entire auditorium that is known today as the Mozart Hall, while the audience watched the production from the balcony. Unlike many of the contemporary stage ideas that were developed on paper, the Space Stage was actually built and used for performances. In conjunction with his theatre projects, Kiesler wrote Dadaistic manifestos that proclaimed a radical renewal of theatre. Acclaimed by his fellow-artists and exposed to ridicule by the press, the Space Stage finally got the pivot of a ludicrous plagiarism controversy with the psychiatrist and founder of the Psychodrama Jacob Levy Moreno, who claimed the priority of the concept. The talk will follow three major threads: The exhibition, its display and Kiesler’s Space Stage as the exhibition’s central project. Gerd Zillner is an archivist, curator and senior researcher at the Austrian Frederick and Lillian Kiesler Private Foundation. He curated several exhibitions, published several articles on Frederick Kiesler and co-edited the recent biography: Friedrich Kiesler: Architekt, Künstler, Visionär, ed. Gerd Zillner, Peter Bogner u. Dieter Bogner, (München 2017). He currently is editing a collection of essential essays on Kiesler’s artistic network: Frederick Kiesler. Face-to-Face with the Avant-Garde, ed. Peter Bogner u. Gerd Zillner, (Basel 2018) and is working, together with Spyros Papapetros, on the edition of Frederick Kiesler’s unpublished book manuscript Magic Architecture. The Story of Human Housing, for which they received a Graham Foundation Grant.